A superb plugin - a big thumbs up from us. conjunction with its analogue Omega preamp. It models the Altec Lansing 458a preamp and comprises just four controls. The Intensity knob progressively overdrives the input, the Output slider gives up to +/-9dB of final volume adjustment either way, Phase inverts the input, and Pad attenuates the input by -20dB (gain compensated). With the Intensity set low, basses are brought forward, drums and percussion start to gain presence, and guitars and vocals sharpen up - there’s a palpable increase in warmth and presence. Crank it up, and the effect quickly intensifies, although never to the point of collapse - the grit, energy and heat it brings to basses, kicks, snares and drum busses in particular can be truly intoxicating. 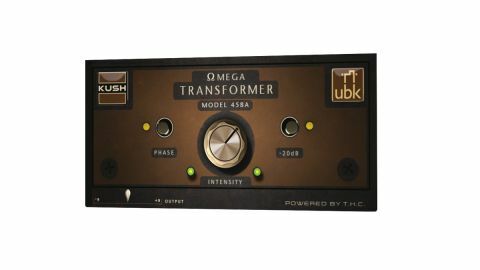 Ultimately, all you really need to know is that Omega 458a just sounds wicked, and despite its surprisingly high CPU usage and lack of wet/dry mix control, we can’t recommend it highly enough.